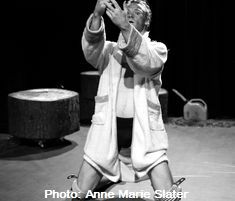 Dates and Venue 11– 16 Nov | PAL Studio Theatre, Vancouver. Performed by Nathan Barrett and directed by Jamie King, this one-man show which was supposed to last at least an hour finished in 40 minutes. Whether the pacing was intended to be super-fast, I'm not sure, but it seemed that Barrett wanted to get over with the show. I had hoped it would have been slower so the audience could digest the subtle innuendoes of the author's text. Barrett is a very physical actor. In this play, he does pushups, aerobics, dances to the tune of 70s disco music, and moves with a lot of versatility. His monologue, though, tends to be monotonous and wooden. This one-man show is the story of Gordon. By day he is in control of every aspect of his life, but by night, the scratching which he has begun to hear in his walls is driving him crazy. Barrett and Mackenzie both graduated from the National Theatre School, Barrett as an actor and Mackenzie as a writer. Barrett has since worked in Montreal, Toronto, Vancouver and Thunder Bay as an actor appearing in everything from Shakespeare to the Buddy Holly Story. He has also successfully tried his hand at writing. FRESH WATER, written and performed by Barrett and Chala Hunter, and was produced in both Vancouver and Toronto. His recent performance in Arts Club's 4000 Miles was well received.